Beautiful, spoilt South African diamond heiress Rianne finds her world suddenly turned upside down after a chance encounter with someone she’d rather forget; intelligent, loyal Gabby, always worrying about everyone else, she needs to start looking after No. 1; pretty, petite Natalie, whose shrewd eye for business helps her forget the one man she can’t have and Charmaine, an outrageous flirt, she just needs someone to pay for the good life she so desperately wants. 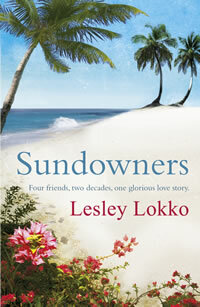 SUNDOWNERS follows the turbulent lives of the four best friends over three decades, moving effortlessly from a boarding school in rural England to the heady days of freedom in South Africa.